I had been pursuing painting, I had finished art school and was involved in a great art scene in Boston when I first moved here in 2003. After a year or so the large studio space we were renting and sharing became a real headache to keep together. I was working in a woodshop building picture frames and had always been intrigued by the idea of building instruments so I gave up my art studio for a while and shifted my attention over to instruments. I found that I really loved it and have spent the last 6 years very dedicated to pursuing that craft. My early projects were building strange things with features I had always wanted to try but had never seen. I built a small fretless teardrop instrument with classical strings that I loved playing. I had a sitar that I liked messing around with and built a few gourd instruments as well. Eventually I got around to building a copy of my Dreadnaught and since that first one I have focused pretty exclusively on steel string guitars. I became involved with the New England Luthiers Guild soon after finishing my first few guitars and the members in that group have been a very direct influence on my work, I feel lucky to have met them and been a part of that group. It is hard to think about what I want to contribute to the craft. I know that I want to build classic guitars without building reproductions but that is a subjective thing so who can say whether I am doing that in anyone’s eyes but my own? I know that I want to respect the history of guitar building, a lot of work has gone into a very successful template that we are (mostly) all working within and I want to honor that however I can. I also want to try to give back to others all the help and encouragement I received when I started, I was made to feel very welcome in the guitar building world and it was (and continues to be) a great thing for me. I really value the community and I think keeping it as healthy as it is is one of the best things I can hope to do for guitar making as a whole. W&W : Talk about how you began setting up your shop. What did you have for tools when you began building? Please talk about some of the benchmarks (pun not intended, I think?) of putting together your shop. My shop has always been dictated by its small size. I built my first few guitars in my bedroom and when I moved in to a larger space where I could convert a small room to a dedicated shop I took that opportunity. Being right in the city even a small space was a real blessing and having it in our home was even better. I had a rudimentary knowledge of basic woodworking but concurrent with learning the craft of guitar building I had to learn a lot about precision woodworking. Many of my initial shop purchases were out of necessity and I bought what I could afford. Most of it was cheap but I made it work and it taught me a lot about the tools and their limitations. I spent a lot of time organizing my space to fit everything in and make the space clean and inviting. The shop floor plan is about 9 x 17 and I was proud the day I had fit everything in there to start and finish a guitar completely from scratch. I consider my shop a continual work in progress and every year I do a renovation of some sort. Lately I have been replacing the original tools I purchased with better examples that will still fit in the space. This has mostly meant searching out old (usually American made) cast iron tools and going through the process of restoring them. I have become really enamored with these tools and the history of American manufacturing. It has been an education learning about how the tools have (or have not) evolved and especially about how and where they were manufactured. Many of the woodworking tools are rather simple machines and once restored the older versions are usually superior to the currently available ones, even if only because they are heavier. I have greatly enjoyed learning about the mechanics of how they work and bringing them back to life. I wish I had some proper photos of these tools in action in my shop but many of them are still in the final stages of getting set up. One thing I did recently was to add on another small shop dedicated to machine tools. I learned some basic machining working for a company manufacturing speaker enclosures and once I understood what was possible I didn’t want to be without my own space to work in. As I have been working on the old woodworking tools I have also been rebuilding some older machine tools and using those in restoring the woodworking tools. Eventually I hope to build a guitar where I make everything in my shop. With the machining room I can tackle the tuning machines which will be one of the last and biggest challenges for me. I see my shop mostly as the place where I can go and make what needs to be made but after having an art studio for so long I still see it in those terms as well. I remained dedicated to cramming absolutely as much as possible in there to accomplish what I need to get done but I realize that I also approach it lately as a museum of sorts and that I have fetishized some of the older machines (and the time period in general) I am working into the space. In that way it almost feels a little like an art project and I think I approach it that way a bit too at times. I like that, it is like a working installation and a healthy way to bridge my interests. W&W : Please describe the evolution of the “bowl” cutaway. 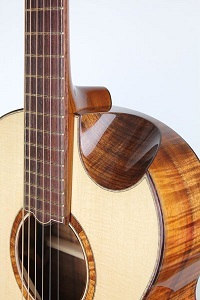 The inspiration of the bevel cutaway was from a photo I saw of someone’s visit to the Healdsburg guitar festival. In the background of one of the shots was a photo of a guitar with a cutaway very similar to what I have been doing. I don’t know whose guitar it was but seeing that focused some ideas I had been working on about how to approach that area a bit differently. It has its limitations, I wouldn’t try to suggest it for everyone. I do like how it looks though and for the way I play at least it is very comfortable. Many other people do similar things and while I respect their work I like mine best. I think it is supposed to be that way. W&W : What are some of the underdog tone woods that you think we’ll be seeing/hearing more of in the future? Do you think the market for Brazilian will continue to level off, or do you see more spikes of price and interest in the future? What about Mad Rose and Honduran, will they suffer the same fate as Brazilian? What can you say about the state of tone woods? That is a tough question. The attention that the Lacey act has been getting lately has certainly brought some of the issues with exotic woods to the attention of the guitar community in a way it hadn’t been in the last few years. I see many more guitars and conversations about using local woods than I did when I started paying attention 6-7 years ago. It does seem that things are swinging in that direction. However, I was looking through some old GAL Red books from the early 90’s (I think) and they were full of articles about the decline of exotic woods and how we were all going to have to go local if there was any future (I am paraphrasing of course). That was 20 years ago and since that time Brazilian became available again and there seemed to be no lack of the exotic woods that the guitar world “prefers”. In that period I spent a few years and a lot of time and money building up an inventory of those woods and am heavily invested in rosewood, spruce, mahogany, and the other few more normal tonewoods used for fine guitars. My interest in dark horse woods is not so high at the moment. I am slightly more interested in local and American woods but right now it is more of a curiosity for me than anything else. I am looking at Paulownia though for blocks and linings, it sometimes feels like Balsa it can be so light. I think there will always be a market for Brazilian, it’s history as the premier tonewood for guitars (whether deserved or not) will always mean people will want it. We may not see it flaunted as completely as it has been in the wake of the stumpwood influx, especially with the Lacey act making people think twice, but I can’t see the market not continuing. I don’t think in the near future it will grow too much but really who knows? I am not currently looking to buy back and side sets but that’s not to say I wouldn’t if the price and quality was right. I would be much more of a stickler about knowing its history than I was at first though. If I had any doubts now about how it was harvested I would definitely pass. I think it is obvious to anyone who pays attention how much illegal behavior goes on with regard to Brazilian in the guitar world and much of it is right out in the open, sometimes even advertised on websites and internet forums. I think that behavior has tainted the wood and Brazilian rosewood and illegal behavior have been sort of linked together in people’s minds. Whether this is willful ignorance, a true lack of knowledge about the laws, or active manipulation of the law is probably different for every situation. I don’t want to be a part of it. I do continue to use Brazilian rosewood, it is my preferred wood for bridges, but I make it clear to the owners that the guitar can never legally leave the United States once it includes that wood. As for Madagascar Rosewood and the others I hope they don’t get the same restrictions as Brazilian but if they do I hope it helps to protect those species. I have excellent stocks of both woods and hope to be able to make many guitars from those woods, I have had nothing but good experiences with them. W&W : Talk more about your obsession with vintage tooling, and where this is taking you in your guitar building. Let me back track a little for this answer. I took a class in art school with Toshio Odate who I know now as a fine woodworker but who I knew then as simply my sculpture professor. He was single minded in that class trying to cleave right down the middle the stark gap between art and craft. As a student I resisted but was won over in the end and do look at it that way now, that art and craft are separate almost completely. I tend to see it as my being protective of “art” and by that I am speaking mainly about visual fine art. I think that we (as a culture) use the word “art” to mean something better described as “creative” or “inspired” and in doing that have lost the real ability to see visual art as a true separate practice with no practical application other than expression. This is not a popular view apparently and I have had more than a few arguments get heated about this topic. I don’t mean it as any kind of value judgement, “art” in my view does not in any way occupy a higher plane than craft, or design, or any other creative pursuit that serves a functional purpose. It just needs to be defined as its own thing, and for me that means a rigid delineation from those other practices. Having said all of this, I view guitar making as a craft completely. More specifically, I see it really as tool building. I spent a long time building guitars thinking like this but without a real model of how I would personally approach it. And that is not a bad thing, but coming from a fine art background I was accustomed to some sort of inspiration that guided me a bit in my work. Lately I have found a model that has really helped me view myself and what I am doing in a way that I love. I spent the last few years working for a man who was absolutely enthralled with American manufacturing. He romanticized it, and it was sometimes cheesy, but his heart was in a place I respect very much and he helped me to see some of that history and quality that was present in the golden age of American manufacturing (and first golden age of American guitarmaking!). Over the past year he became heavily involved in working towards making watches in the style of the old Boston watch companies and we spent a good deal of time collecting the tooling that would allow us to do that. Many of the tools we were searching for were built only a few miles away from where we were located in downtown Boston. I became fascinated with these tools and with companies like Stark, (the old) Pratt and Whitney, Rivett, and Hardinge and their endless variations on similar themes and attempts to outdo each other. The work they did was amazing in its precision and beauty, these were fully functional machines that performed work which was at the time at the very forefront of modern manufacturing yet they also looked and were finished beautifully. As we were finding and purchasing some of these machines for our work there I also sought out a few for myself and have spent time learning about how they were made and slowly refurbishing them for my shop. Understanding how they were manufactured and especially just how much painstaking hand work went into producing these machines that could hold such tight tolerances has been a huge influence on what I feel I should expect from myself as a dedicated maker of things and especially a maker of things in America. I also feel that that time in America was characterized by a sense of ingenuity and an excitement and energy about improving and pushing things forward. Certainly many of those companies made huge leaps in what they were producing leading up to and after the second world war. These are the same things I want to express in my work; Dedication to craft and a dedication to producing something that works as well as it possibly can, the desire to make that same thing beautiful without impeding its function, and a spirit of experimentation and excitement about the future and what it will offer. I have allowed myself to get a bit obsessed, obviously, and that has always been a healthy thing for me. I can build something up in my mind and really use it to push myself further. I am in all ways an amateur with this topic but I have been getting a great amount of joy in learning about and using these old tools and I feel like it has helped me focus even more on improving my craft and focusing me as a builder. I feel fortunate for the inspiration it has given me and also fortunate that I have had access to these tools firsthand. W&W : Who are some of the builders of the present day who are inspiring your work? I think I would have to break it down into a few categories. There are some builders whose guitars I have played and others I have not had the chance to but whose approach has still been a big inspiration to me. The local New England builders have had the biggest influence on me. I have the chance to see them and speak directly to them, sometimes with a guitar in hand. Guys like Steve Spodaryk and Alan Carruth are perfect examples. Steve’s was the first real luthier shop I was able to visit and the meticulousness of his work has set a high bar for me to work towards. I don’t know if I would see the beauty in the older Stauffer themed guitars as clearly as I do if I hadn’t seen and played his guitars. I have become more influenced by these designs lately and that can be traced directly back to Steve’s guitars. Al has influenced how I approach building the guitar. His explorations into Chladni tuning and diligent record keeping have defined some of the process that I use in my work. He presented a talk that Mark Blanchard gave at Healdsburg 2007 that illustrated a very dedicated approach to some of Al’s methods and that has also been an influence into my practice. I have been lucky to make friends with other builders and carry on dialogues with them as well. It is so helpful to be able to talk to someone about day to day guitar building. People like Laurent Brondel, John Osthoff, and lately Trevor Healy have been a great help to me in defining what kind of approach I want to pursue in my guitar practice. There are others I am influenced by but from afar. I love the whole vibe of Kim Walker but I have never met him or even seen or played one of his guitars. I attended a talk by Ken Parker a few years ago at ASIA that changed how I thought about a few things and helped move me further towards expanding my fabrication knowledge. I have played a few guitars that I can’t forget. One was an Ed Claxton guitar that really showed me how round and even a big(ger) guitar can be. It was full of life and had no hollow (in a bad way) spots. I played a Sexauer guitar at Montreal a few years ago that was great, warm and comfortable. That guitar wanted to be played, in a perfect way. I also played a Froggy Bottom guitar that blew me away. It was everything I could have wanted, powerful, clear, and pure. I still think about that guitar all the time. W&W : What would you say is your voice, or tonal signature? I feel like his should be the easiest question but it has turned out to be a bit difficult for me. I don’t want to say that I don’t have a signature sound but the things I want to be in each guitar may not be so specific. I like the challenge of crafting a guitar that the customer will like and that conforms to their expectations. These can be very different instrument to instrument and I very much like the challenge of being able to adapt the materials and techniques to change the sound to match the goal. How successful I am is up to the players of course and so far they have been very pleased. In terms of my signatures I would look for the things I am always pushing for the players to adopt. The first of these is the desire to always err on the side of a more responsive guitar. The downside of this is that it requires more control from the player but the range of sound available to a dedicated guitarist is in my opinion well worth it. I want every guitar to feel alive and feel like it wants to be played. It may sound a bit boring to mention that as who wouldn’t want that in a guitar but it is a big deal to me. I have played many guitars that sounded great, even amazing, but took work to play. I don’t want my guitars to be like that. Being responsive helps but there is something else in that equation, an overall feel or vibe that is very important. I don’t know how to quantify it but I know it when I feel it. I also want the guitar to be balanced. Even one small area can be problematic. I make a point to play the guitars all over the neck and really be thorough in evaluating their response. I’ve spent a good bit of time chasing down minor wolf tones and, when possible, getting rid of them completely makes a huge difference in my opinion. I want all of that to be absolutely transparent, I don’t want the player to have to adapt to any discrepancy in the response. Beyond those things I think there is room to experiment. It is one of the nice things about building steel string guitars, there is no recognized perfect sound. I enjoy that freedom and work to make sure it is not a pass to be lazy but a freedom to push a bit in terms of what I can get from the instruments. It always comes down to the players in the end. I have a guitar here that was built as an experiment and has elicited absolutely opposing responses from different people. It is fascinating to me. I would say that the guitar actually sounded radically different with each of them playing it. Some loved it and others put it down right away. I don’t expect to be able to build a guitar that will appeal to everyone and with that thinking it must be my own preference that guides how I build my guitars. It shouldn’t be a surprise to me then that I want to build versatile and balanced guitars. I am used to working hard to get the most out of guitars as I play a completely random assortment of styles and so expecting the player to be able to exert some control over a guitar seems a natural thing for me. This is not always what is desired though and I can craft a guitar to be controlled in a certain way. My gut instincts though push me to make it a little more open ended. As an easy answer to the question I can talk about a spec guitar I am working on right now. The New England Luthiers Guild is currently working on a year long project with 30 of us all building OM themed guitars at the same time. My contribution to this project will be a mahogany and Swiss spruce CLM model built to be absolutely as lightweight as possible. My hopes in this is to achieve a looseness in the response and a certain type of treble response that I think of as “hollow” although not in a negative way at all. I expect the guitar to sound alive and have a hint of wildness (or jangliness, thank you mahogany) when really pushed but to be capable of some real control when played in a more intimate way. I want the guitar to be balanced in the way that the trebles have some warmth underneath them and the bass notes can have a bite, or growl, when pushed. Most of all though, as I mentioned before, I want the guitar to sing and to inpire the player to be better. It will have a slanted fingerboard with 24 frets on the high strings and the clarity all the way up the fingerboard to be able to be played up to that 5th octave. Right now that is the guitar I am wanting to build. I know it will change in the future but for now those are the things I am excited about and want see in my guitars. W&W : What’s your current output? How long is your wait list for a new build? My wait list has hovered around a year or so for the last few years and at the moment is just under a year. I have some cool projects coming up later this year. I am building an alto guitar for a wonderful local player and also will be modifying an older instrument to be strung like a mandocello for a customer who has changed the kind of music he is playing. I am not a really prolific builder, I put out 5 or so a year working at full tilt. I still have my day job and other hobbies that take up a lot of my time but they all improve the guitar making so I think it is good. I always enjoy hearing from players and guitar enthusiasts and especially enjoy when people can visit my shop. If anyone is near or going to be near Boston and wants to stop by, you are welcome to come see the shop.